As the marketplace become more competitive in each industry, human resource departments and managers are constantly faced with the challenge of how else they could increase the performance of their workforce – in terms of efficiency, engagement and accountability. Yet, despite the arrays of training programs available, CEOs and executives have a hard time to increase staff accountability and the willingness to engage on a permanent basis. No different than a blown-up balloon that deflates eventually – time and money have to be poured in again and again in more staff training ‘motivator’ programs. Management consultant and CEO trainer Hellen Chen, took on a different approach in staff training: advising CEOs and executive skills to improve their own relationships at home instead, in order to increase their work abilities. .
For years as the CEO of an international business management company, Chen had traveled around the world and been invited to government agencies, small and large corporations, organizations and colleges around the world to give solutions on boosting productivity and improving leadership qualities. As a hands-on CEO in her own firm, Chen would spend many hours personally training managers and workers and she observed the phenomenon: when staff members learn how to manage their household better with their spouses and children, they develop more responsibility and care in the workplace towards their fellow team members. Chen, whose passion is also in helping couples to get together, has played matchmaker at first to her employees who are single. Later, she found that staff who got married started to pick up the responsibilities of work better – and those who excel well in their relationships also end up being the well-liked senior in their departments. “It is the ‘training’ which people do not think of. 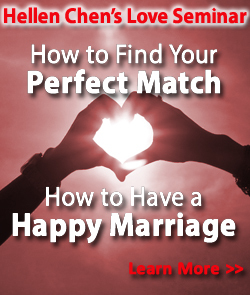 People ask me: you mean, if I learn how to be a better spouse, I would do better in my career? Answer is yes.” smiled Chen. In the last 10 years, Chen has match-made for over 100 single men and women. Her latest bestselling book “The Matchmaker of the Century” which covers real-life stories of couples who turned their lives around despite marriage problems, talks about how management of one’s intimate relationships affects the success of a person in his workplace. 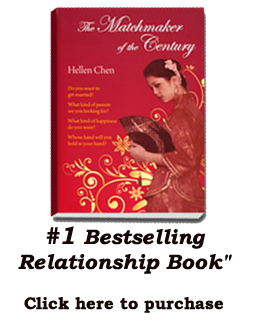 Chen wrote about how a good CEO would have the best of results in leading his or her company if he or she would also learn how to be a better spouse. A 2012 US Census Bureau statistics show that married men and women are earning higher salaries than their single counterparts. However, the question remains on how one could keep a marriage together if the statistics of divorces is climbing up. Having consulted working professionals including doctors and dentists, accountants and top CEOs etc, Chen observed, "We spend lots of time honing our professional skills but as far as relationship skills at home with our spouses and children are concerned, we hardly consider it necessary to learn how to improve them." In a Fox TV interview, Chen also talked about the pitfalls of the dating culture of today - going in and out of relationships no different than changing jobs every 2-3 years. “The person who is changing relationships frequently will get more and more confused about relationships.” said Chen “If one is hopping from job to job, trying to find the job that offers the next better benefit, he or she will usually end up in the unemployment line." As part of a series of workshops to help executive and career professionals learn to develop relationship management skills in their personal lives, Chen will be holding a West Coast workshop on May 4th 2013 in Los Angeles.